Interplanetary space missions can be launched only at certain times. These launch windows are dependent upon both the relative positions of Earth and the target planets, and the capabilities of the available launch vehicles. 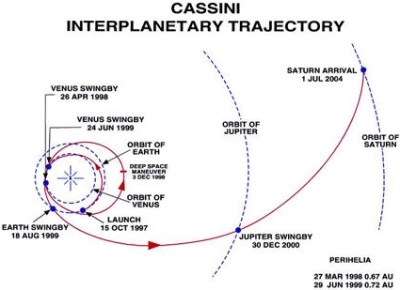 The primary launch period for Cassini, based on the alignment of the planets and the capabilities of the Titan IV/Centaur launch vehicle, was in October 1997. The launch boosted the spacecraft into a Venus-Venus-Earth-Jupiter Gravity-Assist (VVEJGA) trajectory toward its final destination of Saturn. A gravity assist flight path is required because the spacecraft is too heavy to be injected into a direct trajectory to Saturn. Under such a plan it would not acquire enough speed to reach Saturn in a realisitic time scale or have sufficient propellant left over to allow braking for orbit insertion around Saturn. The principle of gravity assist boosts the spacecraft's velocity because the planet and the spacecraft tug on one another while orbiting the Sun. The spacecraft makes the planet lose some of its orbital momentum. From a planet's point of view, the spacecraft departs with no net energy gain, but from the Sun's point of view, the energy exchange makes a very small change in the planet's solar orbit. That amount of energy, though, benefits the tiny spacecraft substantially. The power comes from the planet's motion about the Sun. 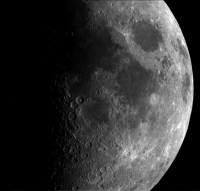 The Moon as seen by Cassini from a distance of about 377 000 km, around the time of the Earth gravity assist on 18 August 1999. 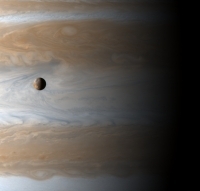 Io transits the face of Jupiter, as seen by Cassini on 1 January 2001, two days after the Jupiter gravity assist.